Fatigue and a color-vision deficiency that affected the ability of the pilot flying to observe glide-path-indicator lights contributed to the flight crew's failure to conduct a stabilized approach. A Boeing 727-200 freighter was scheduled a night cargo flight. On arrival the flight crew conducted two unsuccessful approaches in darkness and poor weather conditions before landing on the third approach. A post-flight inspection of the aircraft found visible damage on the left wing. The tip of the left outboard leading edge flap and the outboard trailing edge flap ?canoe? were abraded. The damage was consistent with a slight contact with the runway. During a climb to FL270 with autopilot engaged, the aircraft did not capture the selected altitude. The Captain disconnected the autopilot and then experienced difficulty in accurately controlling the aircraft in pitch. On 20 August 2011, a Boeing 737-200 Cargo on a domestic passenger charter flight from Yellowknife, (Canada), to Resolute Bay (Canada). Whilst in the final stages of a daylight ILS approach at destination in IMC, the aircraft struck a hill about 1 mile to the east of the landing runway and was destroyed by the effects of the impact and subsequent post-crash fire. The military TWR controller at the destination airport did not see the aircraft at any time and there was a significant delay before the wreckage was located. Twelve of the 15 occupants were killed and the remaining 3 sustained serious injuries. From London to Athens: how a fuel imbalance lead to control difficulty! During takeoff from Tamanrasset (Algeria), a sharp thump was heard just after rotation. The left engine had just suffered a contained burst. The airplane swung to the left. The Captain took over the controls. The airplane lost speed progressively, stalled and crashed, with the landing gear still extended, about one thousand six hundred and forty-five meters from the takeoff point, to the left of the runway extended centerline. On March 5, 2000, Southwest Airlines,flight 1455, a Boeing 737-300 overran the departure end of runway 8 after landing at Burbank-Glendale-Pasadena Airport, Burbank, California (USA). The airplane touched down at approximately 182 knots, and about 20 seconds later, at approximately 32 knots, collided with a metal blast fence and an airport perimeter wall. Report by Indonesian investigators cited lack of data and rejected U.S. National Transportation Safety Board suggested conclusions that the airplaneâ€™s descent was caused by intentional, sustained manual flight control inputs that most likely were made by the captain. The aircraft contacted the runway and then bounced up into the air again before full runway contact was made with the main landing gear tires followed by the nose landing gear tire. The aircraft was not decelerated enough when nearing the runway end so the pilot flying attempted to turn the aircraft onto taxiway November at the end of the runway. The aircraft skidded off the taxiway and came to rest parallel to the taxiway with the nose landing gear and the right main landing gear off the paved surface. The aircraft suffered an in-flight failure of the DC Battery Bus, resulting in the loss of several aircraft systems including the standby ADI. All 132 occupants were killed when the airplane struck terrain near Pittsburgh, Pennsylvania, U.S. The investigation report said that, following an encounter with wake turbulence, the airplaneâ€™s rudder moved to the limit of its travel, in a direction opposite to that commanded by the flight crew. The report said that the rudder-control anomaly most likely was caused by a malfunction of the rudderâ€™s main power control unit. A Boeing 737-400 aircraft was on a scheduled passenger flight from Surabaya, East Java to Manado, Sulawesi, at FL 350 when it disappeared from radar. The DFDR analysis showed that the aircraft was in cruise with the autopilot engaged. The autopilot was holding 5 degrees left aileron wheel in order to maintain wings level. Following the crewâ€™s selection of the right IRS Mode Selector Unit to ATT (Attitude) mode, the autopilot disengaged. The control wheel then centered and the aircraft began a slow roll to the right. The aural alert, BANK ANGLE, sounded as the aircraft passed 35 degrees right bank. The DFDR data showed that roll rate was momentarily arrested several times, but there was only one significant attempt to arrest the roll. Positive and sustained roll attitude recovery was not achieved. Even after the aircraft had reached a bank angle of 100 degrees, with the pitch attitude approaching 60 degrees aircraft nose down, the pilot did not roll the aircraftâ€™s wings level before attempting pitch recovery in accordance with standard operating procedures. The aircraft reached 3.5g, as the speed reached Mach 0.926 during sustained nose-up elevator control input while still in a right bank. The recorded airspeed exceeded Vdive (400 kcas), and reached a maximum of approximately 490 kcas just prior to the end of recording. Whilst in the cruise the crew began to feel some discomfort in their ears. This was shortly followed by cabin altitude warning horn which indicated that the cabin altitude had exceeded 10,000 feet and this was seen to continue to climb on the cockpit gauge. At the same time, the primary AUTO mode of the pressure control failed, shortly followed by the secondary STBY mode. The crew selected the first manual pressure control mode, but were unable to control the cabin altitude. An emergency descent and subsequent diversion was carried out. On 15 June 2006, a Boeing 737-300 cargo aircraft had to divert due to bad weather. On final approach the autopilot was disengaged for a short period. The aircraft touched down off the runway to the left, resulting in the right main landing gear being detached and the right wing tip and engine scraping the ground. The pilots managed to lift off again and subsequently made an emergency diversion where a landing was performed on the remaining two landing gears, during which the aircraft scraped on its nose and right engine. There were no injuries. The cause of the crash was determined to be a poorly timed message from local air traffic control which the pilot misinterpreted, causing him to descend too quickly. On a scheduled cargo flight from Liège Airport (Belgium) to London Stansted Airport (UK) the crew diverted to Nottingham East Midlands Airport (UK) due to unexpectedly poor weather conditions at London Stansted. The weather conditions at East Midlands required a CAT IIIA approach and landing. On approach, at approximately 500 feet agl, the crew were passed a message by ATC advising them of a company request to divert to Liverpool Airport (UK). The Captain inadvertently disconnected both autopilots whilst attempting to reply to ATC. He then attempted to re-engage the autopilot in order to continue the approach. The aircraft diverged to the left of the runway centreline and developed a high rate of descent. The Captain commenced a go-around but was too late to prevent the aircraft contacting the grass some 90 m to the left of the runway centreline. The aircraft became airborne again but, during contact with the ground, the right main landing gear had broken off. The crew subsequently made an emergency landing at Birmingham Airport (UK). After a stable instrument approach, the engines of the Boeing 737-800 remained at approach power during the landing flare and the aircraft bounced. The thrust levers were then moved to idle, the speed brakes deployed automatically and during the subsequent heavy landing, the tail of the aircraft scraped along the runway. A Boeing 737-800 departed from Rotterdam Airport (Netherlands). The flight was scheduled for a three leg flight via Maastricht-Aachen Airport (Netherlands) and Arrecife (Spain), Lanzarote Airport (Spain) to Amsterdam Airport Schiphol (Netherlands). Immediately after initiation of the take -off, when the aircraft started to roll, the aircraftâ€™s nose pitched up. This movement stopped when the aft fuselage and the tailskid assembly touched the ground. After the cockpit crew rejected the take -off, the aircraftâ€™s nose touched the ground again and the aircraft was brought to a hold. The occurrence damaged the aircraft considerably. As a result, the crew could not resume the flight. None of the 113 passengers and seven crew members was injured. After the occurrence, the aircraft was taxied to the apron. At this location the passengers left the aircraft. The pilot's decision to take-off in known adverse weather conditions and failure to execute the proper windshear recovery procedure resulted in operating the aircraft outside the safe flight regime, causing the aircraft to stall very close to the ground from which recovery was not possible. The causes of the accident were the incorrect positioning of a de-icing vehicle left without its driver and the crewâ€™s incorrect perception of the dimensions of the obstacle in a difficult environment in terms of lighting. On September 5, 2000, a Boeing B747-300 departed from Jakarta, Indonesia and experienced a serious incident shortly after take-off in which the No 1 engineâ€™s fifth low pressure turbine (LPT) disk failed, ejecting debris damaging the airframe structure and several houses in a village. Investigators said that published procedures were not followed when the repair was performed more than 20 years before a structural failure occurred and the aircraft broke apart during flight. On September 3, 2010, a Boeing 747-400 flying the route between Dubai International Airport and Cologne Bonn Airport developed an in-flight fire, with the fumes and subsequent crash resulting in the death of the two crewmembers. The aircraft had departed Dubai International earlier, but returned after reporting smoke in the cockpit. The crash caused an examination of safety procedures protecting airliners from cockpit smoke. The aircraft encountered a brief period of severe turbulence during the cruise portion of flight, resulting in injuries to nine passengers and one cabin crew member. The flight crew had left the intended track to avoid significant weather which they had detected on weather radar. However, at the time of the incident, there was no significant weather indicated on radar. The initial cause of the accident was the incomplete reduction of thrust on the left outer engine at the beginning of deceleration. This caused the de-activation of the automatic braking systems and the non-extension of the nÂ° 1 thrust reverser. The inadvertent selection of full thrust on this engine after the landing created high thrust asymmetry leading to the runway excursion. The lack of co-ordination and of joint control by the crew members, perhaps aggravated by the presence of third parties in the cockpit, contributed to the development of this situation. This is a more detailed document of the australian registered Boeing 747 which overran the runway in Bangkok airport, Thailand (see above). The B747 was configured for a dry-runway landing when heavy rain occurred on final approach. The captain told the first officer (the pilot flying) to go around but then retarded the throttle levers when the main landing gear touched the runway. The airplane was substantially damaged. None of the occupants was injured seriously during the approach-and landing accident, but the delay in evacuation of the aircraft focused attention on improving training for emergencies. On takeoff both stick shakers began to operate continuously shortly before V1. The Captain elected to continue the takeoff and, after a period of troubleshooting in the air, dumped fuel and returned to land. Maintenance engineers consulted the aircraft BITE (Built-In Test Equipment) and replaced the right-hand ADC (Air Data Computer). The subsequent takeoff proceeded normally until approximately 5 kt before V1, when the stick shakers again began to operate. The Captain immediately rejected the takeoff and the aircraft was stopped safely approximately two-thirds of the way along the runway. There was no damage or injury. This report includes a number of Safety Actions implemented by the operator and the aircraft manufacturer. On 2 October 1996, a Boeing 757-200 on a scheduled passenger flight at night from Lima (Peru) to Santiago (Chile) experienced control difficulties because of incorrect flight instrument readings. A return to Lima was attempted but when control was lost the aircraft impacted the sea and all 70 occupants were killed. Investigators concluded that the airplane had a blocked pitot tube and that, during departure, the flight crew became confused by false indications of increasing airspeed and did not respond to a stall warning. All the occupants were killed when the airplane struck the Caribbean Sea off the northern coast of the Dominican Republic. During an ILS approach, ATC instructed the crew to conduct a go-around. This maneuver was mishandled and it led to a slat and flap overspeed with an associated caution message. The QRH actions were not followed correctly. The crew continued to try to resolve the flap problem and, despite straying from the QRH instructions, they did ultimately regain normal flap control. When the aircraft arrived on stand, the total fuel was 700 kg below the final reserve figure and there was an imbalance of 500 kg between the tanks. A Boeing 757-200 on a passenger flight from Freetown (Sierra Leone) to London Heathrow (UK) was in the cruise at night in IMC at FL370 when vibration levels on both engines increased. When the prescribed ice shedding drill was followed, one engine malfunctioned and vibration on the other remained abnormally high and so a MAYDAY was declared and a diversion to Nouakchott (Mauritania) was made without further event. None of the 103 occupants were injured and there was no engine damage. The incident to the Boeing 757 aircraft occurred on the first flight following a 26-day major maintenance check. Shortly after takeoff on a scheduled passenger flight from London Heathrow (UK) to Paris (France), a hot oil smell, that had been present in the cockpit on engine startup, returned. The flight crew donned oxygen masks and immediately diverted to London Gatwick Airport. During the autopilot-coupled ILS approach to Gatwick, the aircraft drifted to the right of the localiser after selection of Flap 30. When the autopilot was disconnected, a large amount of manual left roll control was needed to prevent the aircraft from turning to the right. It was necessary to maintain this control input until touch down. The aircraft landed safely despite these difficulties, with no injuries to any of the passengers or crew. The investigation determined that the incident had been caused by maintenance errors that had culminated in the failure to reinstall two access panels, on the righthand outboard flap and incorrect procedures being used to service the engine oils. The events were the result of a combination of errors on the part of the individuals involved and systemic issues, that had greatly increased the probability of such errors being committed. The crew of a Boeing 757-200, Flight 965, was transitioning from cruise flight to a very high frequency omni-directional radio range (VOR) / distance measuring equipment (DME) instrument approach to runway 19 at the Alfonso Bonilla Aragon International Airport (SKCL), Cali, Colombia, when the aircraft collided with a mountain 53 kilometers (33 miles) northeast of the CALI VOR. The flight crew did not maintain visual contact with the runway while circling to land outside the circling-approach area at an airport in South Korea. The controlled-flight-into-terrain (CFIT) accident occurred about five seconds after the first-officer called for a missed approach. On 19 June 2009 a Boeing 767-300 on a scheduled passenger flight from Chicago Oï¿½Hare (USA) to Warsaw (Poland) was in the cruise at FL330 in night IMC when one of the air speed indicators suddenly displayed a false high reading, which triggered an over speed warning,and one of the altimeters recorded a simultaneous sudden increase. The flight crew response was based on the presumption that the speed increase was real and thrust was reduced and the aircraft put into a climb. A stall warning followed and descent was then made to a level 5000ft below the previous cruise level followed by a diversion to Toronto (Canada). There were no injuries to the 216 occupants and the aircraft was undamaged. The flight crew responded to a visual illusion with an unwarranted power reduction, said the official accident investigation report. Just before landing, the aircraft's pitch attitude increased; the tail skid struck the runway surface as the aircraft landed. On 13 December 2008, a Boeing 767-300 departing from Manchester (UK) for Montego Bay (Jamaica) was considered to be accelerating at an abnormally slow rate during the take off roll on Runway 23L. The aircraft commander, who was the pilot not flying, consequently delayed the V1 call by about 10 - 15 kts because he thought the aircraft might be heavier than had been calculated. During the rotation the TAILSKID message illuminated momentarily, indicating that the aircraft had suffered a tail strike during the takeoff. The commander applied full power and shortly afterwards the stick shaker activated briefly. The aircraft continued to climb away and accelerate before the flaps were retracted and the after-takeoff check list completed. The appropriate drills in the Quick Reference Handbook (QRH) were subsequently actioned, fuel was dumped and the aircraft returned to Manchester for an overweight landing without further incident. On 29 July 2011, a Boeing 777-200 was parked on the departure gate whilst awaiting the last few passengers and completion of hold loading when a fire suddenly began at the lower right hand side of the flight deck. Despite prompt attempts to extinguish the fire, it continued to burn out of control causing major structural damage to the front of the aircraft. 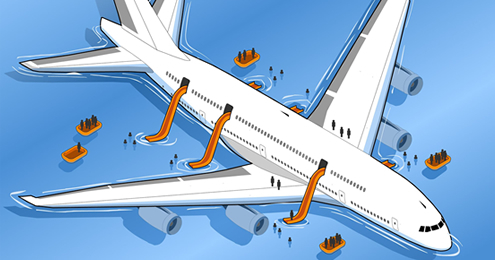 However, all 317 occupants were safely evacuated using the still-attached air bridge access at doors 1L and 2L. The National Transportation Safety Board (NTSB) determined that the probable cause of this accident was the flight crew’s mismanagement of the airplane’s descent during the visual approach, the PF’s unintended deactivation of automatic airspeed control, the flight crew’s inadequate monitoring of airspeed, and the flight crew’s delayed execution of a go-around after they became aware that the airplane was below acceptable glidepath and airspeed tolerances. After takeoff from London Heathrow Airport a vapour trail was seen streaming aft of the aircraft. The flight crew diagnosed that the aircraft was probably leaking fuel from the centre wing fuel tank. They declared an emergency and decided to jettison fuel to reduce to maximum landing weight before returning to Heathrow. On 1 March 2005, a Boeing 777-200 being on a scheduled passenger flight from Lahore to Manchester experienced a landing gear fire during taxi in at destination after an apparently routine landing in normal day visibility. There were no flight deck indications of a significant fire but an emergency evacuation was recommended by attending Fire Crew and carried out. Thirty one of the 344 occupants sustained minor injuries during this evacuation and the rest were uninjured. Five firefighters also sustained minor injuries as they assisted passengers from the slides. Damage to the aircraft was minor. On 5 September 2001, a Boeing 777-200 on the ground at Denver, Colorado, was substantially damaged, and a refuelling operative killed, when a fire broke out following the failure of a refuelling coupling under pressure because of improper attachment. On 7 January 2013, an electrical burning smell and smoke was reported from the aft passenger cabin of a Boeing 787-8 which had just arrived at Boston from Tokyo Narita on a scheduled passenger flight. It was found that the source of the smoke was the Lithium-Ion APU battery located in the aft electrical equipment bay where both a flame and dense smoke were reported to have been seen coming from the battery case. The ARFF was called and the fire extinguished with a minor burn injury sustained by one fire fighter.